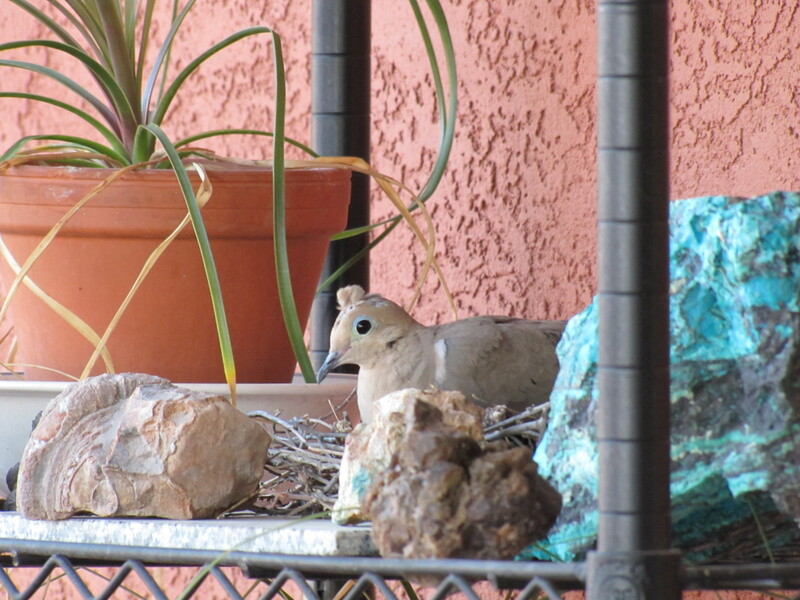 Mourning doves are the most common and widely occurring game bird in Arizona. Their range extends throughout the U.S., southern Canada, and south through Central America. And many of them like to nest on my back porch. Mourning doves are 10 to 13 inches long and have spotted wings. Their color varies from brown, grayish-brown, to gray. The Arizona Department of Fish & Game claims you can distinguish males from females as follows: “The more richly colored adult males can usually be distinguished at all times of the year from the browner females by their pinkish rose breasts, flecks of metallic green and other iridescence on the napes of their necks, and their slate blue crowns.” Maybe. I’ve found that it takes just the right lighting conditions to see these features. “Juvenile birds can be identified up to 4 or 5 months of age by the white tipping on the margins of their wing feathers.” Mating behavior is a more reliable way to distinguish males from females. The male on the make will puff up its neck, hunch its shoulders and coo to a female. The sound may be mistaken for an owl’s hooting. Mourning doves are noisy flyers. When launching and landing, their wings produce a distinct whistling sound. They are also fast flyers and can cruise at 55 mph. In the desert, this allows them to fly long distances to reliable water sources which they require. Mourning doves are monogamous and mate from February through October. They may raise up to seven broods during that time. The female builds the nest while the male provides construction material. The nests are usually rather flimsy and are built almost anywhere. The female generally lays two eggs and both male and female sit on the nest. Daddy does the day shift; the female takes the night shift. I had not realized that both parents sit on the nest because their appearance is very much alike. However, recently one male of a pair nesting on my back porch had a distinctive displaced feather on its head (see photo) allowing me to easily distinguish individuals. That pair switched duties at about 7 am and 5 pm. Mourning doves eat seeds and fruit. They also ingest sand to help grind up the seed in their crop. Eggs hatch in about 14 days. To feed the young, both parents produce “crop milk” which is regurgitated to feed the squabs (baby doves). Crop milk is very nutritious and contains more protein and fats than cow’s milk. The squabs fledge about 15 days after hatching, but usually stay around for another two weeks begging food from the parents. They reach sexual maturity in about 85 days. If a predator approaches the nest, the parent may fly off and feign injury to distract the predator. In Arizona, mourning doves are year-round residents, but those in more northern climes migrate. In the spring, they are joined by the larger white-winged doves. More photos and information are available at Avian Web. 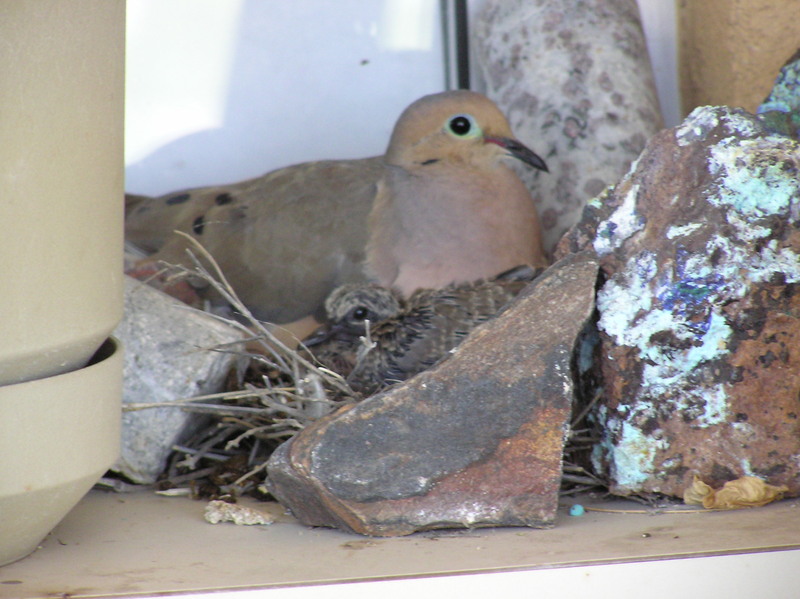 Posted in Natural History and tagged crop milk, Mourning dove, nesting, squabs on April 8, 2011 by wryheat2.